From the late 1980s onward, robotic vehicles have become an increasingly important component of security operations and related activities. They can be used to gather information in areas where a human could not safely go and undertake tasks a human could not safely perform. Robotic vehicles can be used, for instance, in underwater minesweeping, and in sites contaminated by nuclear, biological, or chemical materials. The use of robotic vehicles on scientific expeditions to such inhospitable locales as the polar ice cap and the surface of Mars portends a variety of applications for intelligence gathering. Robotic technology also has uses in energy harvesting, or the gathering of energy from ambient sources such as sunlight, wind, or barometric fluctuations. A 1994 article in The Industrial Robot identified five parameters or "subtasks" of robotic operation: localization, motion control, mapping, path planning, and communication with the operating station. The subtask of localization is a matter highly analogous to human movement. If a person does not know his or her location, that person cannot know where he or she is going; in order to stay on the right path, it is necessary to receive continual data regarding the environment. For the human mind, these skills are largely automatic—one does not have to think about walking around an obstacle, for instance—but for the robot, course correction must be built into the overall operating system. Closely related to the problem of localization is that of motion control. Some robots operate on set paths analogous to a railroad track, but as technology has progressed, scientists have developed means that will allow robotic vehicles to operate in a less modified environment, using navigational markers. These markers are reflective targets that serve as beacons, allowing the robotic vehicle to correct its course when it strays from a desired path. Efforts to make these vehicles capable of operating in a completely unrestricted environment are ongoing. Also closely related to localization is the issue of mapping the environment—a function that, once again, is automatic for humans. Robots use visual, ultrasonic, and touch sensors. More sophisticated machines made for operating in an outdoor locale have means of navigating by visual methods using focus-enhancing technology. Robotic scientists are using ever more sophisticated means of navigation. Among these is the use of a camera to provide data allowing the home station to implement course correction measures. The Global Positioning System, or GPS, also offers a method of aiding navigation in large, open environments. Still more complex are various techniques applying teleoperation through virtual-reality systems. Path planning and communication. Path planning involves addressing the problem of minimizing the output of time or energy required to reach a certain goal. In spatial terms, path planning involves helping the robot to find the shortest possible distance between two points. Temporal or time-based path planning may be more challenging in view of unpredictable inputs from the environment. Finally, there is the matter of communication with the home station, a problem encountered by humans in tasks ranging from intelligence gathering to space travel. In addition to receiving information on changing courses or tasks, robots undertaking sophisticated activities may need to send back video data or other forms of intelligence. The applications, and potential applications, of robotic vehicles are myriad. Within the realm of industry, they can be used for everything from moving containers in ports (an application demonstrated in 1994) to clearing snow off of airport runways. On a consumer level, robotic technology can be employed in wheelchairs and in cleaning homes or offices. 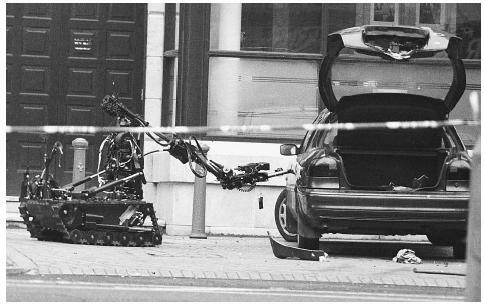 A British Army robot inspects a suspect vehicle for explosives outside the Europa Hotel in Belfast, Northern Ireland. are either presently or forever inaccessible to humans. The use of a robotic vehicle to collect data during the 1997 National Aeronautics and Space Administration (NASA) Mars Pathfinder Expedition gained widespread attention, but scientists also use robots much closer to home. Small, submarine-like robots known as autonomous underwater vehicles (AUVs) have in some cases taken the place of acoustic remote-sensing technology to map seabed topography. They also offer promise in areas impenetrable to more traditional methods—for instance, for mapping hydrothermal vents beneath the Arctic Ocean. Security and related activities. Applications for robotic technology in security and related functions are fast emerging. At the simplest level, a robotic vehicle "walking a beat" could be used to patrol a parking garage by providing real-time video data to a facility security station. The U.S. Navy in the 1980s began using AUVs to conduct minesweeping operations in the Persian Gulf. In 1996, scientists at Lawrence Livermore National Laboratory created a prototype for a robotic vehicle that could be outfitted for a variety of tasks, including not only mine detection and clearance, but also intelligence-gathering. In 2000, Design News reported that technicians at Sandia National Laboratory were in the process of developing a highly sophisticated machine called a MARV, or miniature autonomous robotic vehicle. Very small—a cubic inch (16.4 cc) in size—the MARV is designed to "rove in packs" for purposes such as surveying a contaminated area, sweeping for and disabling mines, or locating biological weapons. Engineers at Sandia have addressed the problem of course correction through genetic algorithm-based software, a fascinating innovation intended to mimic the functions of a human brain. Energy harvesting. An area of research in which robotic technology plays a dual role, both as a tool and as a potential beneficiary, is energy harvesting. The latter is the gathering of energy from ambient sources, including sunlight, wind, wave action, water currents, geothermal components such as volcanoes, chemical and thermal gradients, barometric fluctuations, electromagnetic radiation, and human and other biological systems. The aim of energy-harvesting efforts using robotic technology and other means is to increase the efficiency of power delivery by a factor of 10 with respect to conventional systems. The U.S. Defense Advanced Research Projects Agency (DARPA) has expressed an interest in developing robotic technology for the purposes of energy harvesting, as well using energy-harvesting methods to supply power to robotic vehicles. In 1997, DARPA allocated $25 million toward energy-harvesting projects, among which was a robotic "boot" (functional by 2001) that harvests energy from walking. In 2002, engineers at Pennsylvania State University introduced an optimized energy-harvesting circuit capable of improving retrieval systems from vibration—including that of machine operation and human motion—by a factor of four. Among the applications for this energy-harvesting technology, researchers noted, were robotic control and guidance systems to be used in manufacturing and other activities. "Circuit Transfers Four Times More Power out of Vibration." Resource 9, no. 11 (November 2002): 6. "Designed for Danger." Design News 55, no. 2 (January 17, 2000): 28. "EDM on Mission to Mars." Manufacturing Engineering 119, no. 4 (October 1997): 116. Evers, Stacey. "DARPA to Reap Benefits of 'Energy Harvesting'." Jane's Defence Weekly. (November 26,1997): 8. Jarvis, Ray. "Robot Navigation." The Industrial Robot 21, no. 2 (1994): 3. "Novel Design of Countermine Robot." Jane's International Defense Review (February 1, 1996): 20. "Robo P.I." American Scientist 90, no. 1 (January/February 2002): 28–29. Treherne, Jan. "Robotic Roads—Pathways to the Future." The Industrial Robot 21, no. 5 (1994): 3. Energy Harvesting. Defense Advanced Research Projects Agency. < http://www.darpa.mil/dso/trans/energy/ > (April 15, 2003).